The first step to building your tree house is to find the right tree. Nothing says “summer time” quite like taking a few days to build a tree house. It doesn’t need to be fancy. Your tree house is going to be the place of many great childhood stories and memories, and that is the most important part. The first step to building your tree house is to find the right tree. Most trees will support a tree house, but some are better suited to the job than others. What Makes a Tree a Good Tree House Tree? The ideal tree house tree is large and strong, but flexible enough to bend and support the heavy weight. Choosing a tree that is less prone to disease will be an added bonus if you plan to leave your tree house there for a long time. Your tree should be matured enough that it is pretty much done growing, but not so old that it doesn’t have many good years left. Anchoring a structure to a tree that is nearing the end of its days can cause a lot of stress and can hasten its demise. Once you’ve found the right tree, you will need to choose the right spot on that tree to place your tree house. If it’s too high, that can create too much stress on the tree and the structure of the tree house itself. Generally speaking, the best place for a tree house is no more than 10 to 15 feet up. Choosing a spot that has a lot of branches, or several trees that are close together can help support the weight of the tree house. Call Nelson Tree Specialist today to evaluate your dream tree house location! Nelson Tree Specialist provides specialty arborist services, tree crane services, tree care services, and dead tree removal services. We are well known for our top-notch skills and professionalism. All of our workers are experts at caring for a variety of tree species, so any tree that’s in your yard will be expertly treated or removed. We are members of the International Society of Arboriculture and we are considered certified arborists. We are also an accredited business through the Better Business Bureau and we have great reviews through Angie’s List. 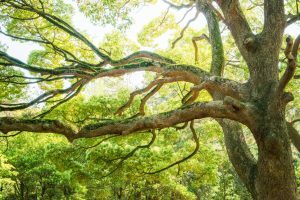 To find out how we can help your trees, whether they are exotic and strange or normal and plain, give us a call at (301) 854-2218 (Washington, D.C.) or (202) 909-5662 (Baltimore) or visit us online. For more interesting tree facts and tips, follow us on social media on Facebook, Twitter, and Google+. This entry was posted on Friday, August 18th, 2017 at 10:40 am. Both comments and pings are currently closed. Do You Need to Water Trees? When Should You Remove Trees? To provide 100% client satisfaction to all of our clientele and be recognized as a premier Tree Services Company in the area.